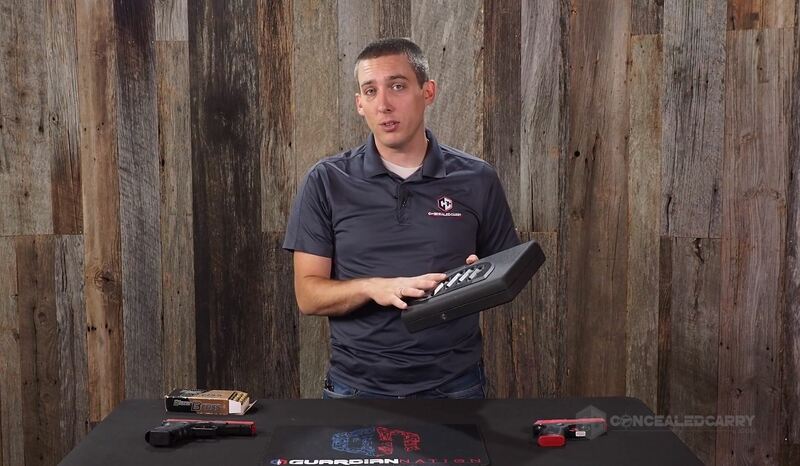 Take this online video course to enhance your handgun skills and knowledge. 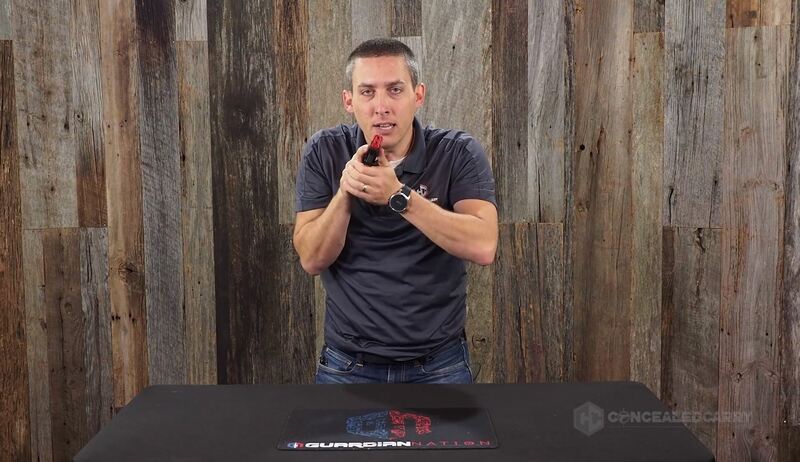 Plus, no matter where you live you can qualify to receive a concealed carry permit, valid in 29 states, by taking this ONLINE-ONLY virtual training class. Sound hard to believe? Read on! 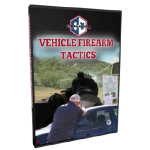 PLUS you get tons of extras and bonuses that you would never find at a typical basic firearm class that will help keep you and your family safe and prepared! Are you a beginner who is looking for the most important safety and handling instruction? Have you been wanting to get your permit but can’t seem to find 2 whole days on your calendar? Are concealed carry courses in your area overly complicated and expensive? Are you hesitant to let a local “expert” try to teach you how to hold your gun? Taking a class at the range can be difficult. You have to give up a full day or more, buy expensive ammunition, and hope you can hear the instructor over all the noise. If you have been shooting guns your whole life it won’t matter… they still want you to take the same steps as every rookie on the street. That is when I decided there had to be a better way. I researched the gun laws in each of the 50 states to search for a loophole in the law that will help me get the proper training and permits into the MAXIMUM number of hands as possible. That is when I discovered the secret. There is a way I can give you the training required over the internet and you can get legally licensed to carry a concealed weapon in 29 states. 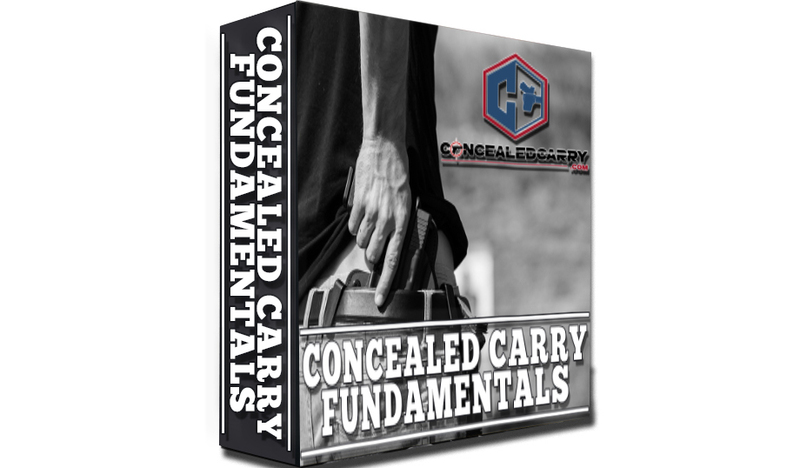 You see by taking this online course and watching some videos you will not only be prepared to carry a gun and be prepared to use it against the threats that surround us but also be able to get a concealed carry permit. This new online only course will skip the drama and give you the critical insights you need to be safe and legal as you strive to protect yourself and your loved ones. 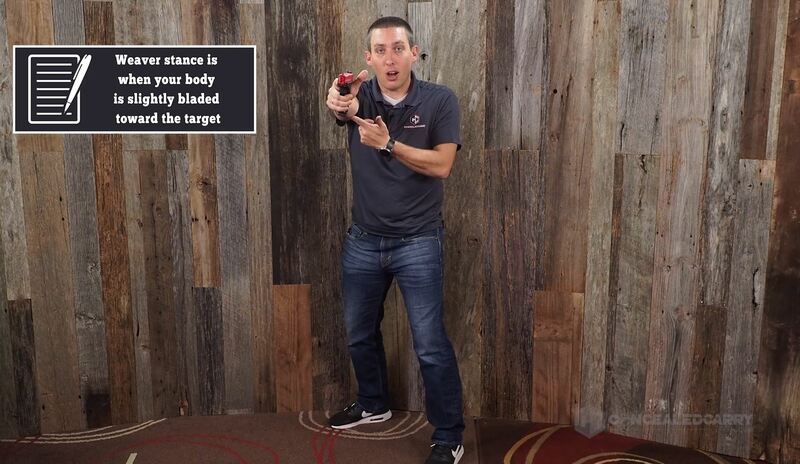 I am the founder of ConcealedCarry.com, today’s fastest-growing firearm instruction company in the United States. As of this writing, we are delivering in-person firearm instruction in 21 US states, teaching thousands of new Americans each year about firearm safety, handling, proficiency, and legal concerns. 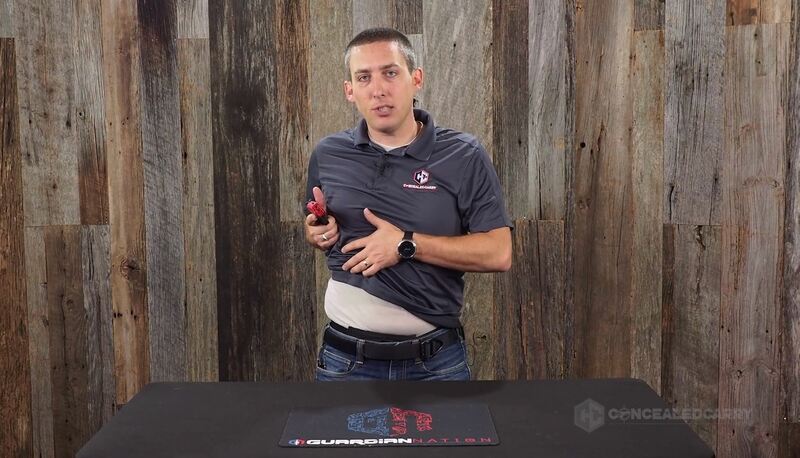 In addition to in-person training, ConcealedCarry.com also provides online courses and training options to Americans via its website. Prior to ConcealedCarry.com I founded Justice Education Security, a private security business that provided executive protection services to executives, celebrities, and other important assets. I am a certified NRA Instructor, Utah BCI Instructor, licensed private investigator, certified Range Safety Officer, Certified Armorer for Glock and Sig Sauer, Affiliate Instructor for Next Level Training and L.A.S.R., and a USCCA certified instructor. I have personally given in person firearm training to over 5,000 students in the last 5 years. 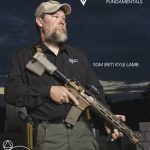 I am also the author of self-defense and firearm-related books and am the editor in chief for the ConcealedCarry.com blog. I want to invite you to take a training that will change your life as it has done for the thousands of students that have received it in the past. Plus, this course will qualify you to apply for your concealed carry permit from the state of Virginia which happens to currently allow ANY US citizen from ANY state to apply for an receive their permit by just taking this ONLINE ONLY class. What is this online course exactly? This course is a basic firearm course that covers core firearm operation, safety, maintenance, and laws. 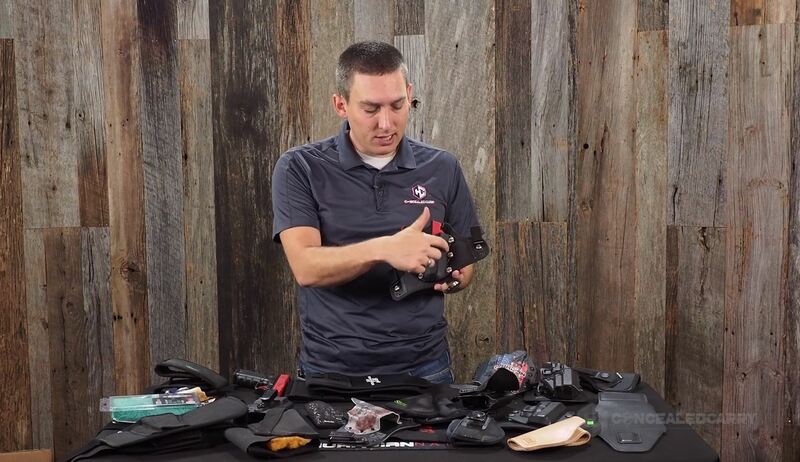 It is designed for anyone who is getting started with handgun ownership. It ALSO happens to qualify the student to apply for the Virginia resident or non-resident concealed carry permit. Is The Permit Good Everywhere? No, it won't be. You would be applying for the Virginia permit and it will only be good in states that honor their permit. The map below will clarify which ones. Yes. Right now Virginia allows you to qualify for their permit via this online class. That could change but if it did that wouldn't affect you if you already have the permit. Right now the Virginia permit is honored in the states as shown below. That map is likely to change and when it does that would affect you even if you already have the permit. What if I don't live in Virginia? It doesn't matter. Any US citizen can apply for the Virginia non-resident permit. Can I just apply for the permit in my local state? Probably not without taking a local course. Most states require you take an in-person training course in order to qualify for your local state permit. Our online course wouldn't qualify. If I take this course am I guaranteed to get the permit? No, we guarantee that this course meets the training requirements set by the state of Virginia but you still have to submit all the paperwork to them and pass a background check. Didn't Virginia recently announce they aren't going to recognize permits anymore? Not exactly. In December 2015 Virginia did announce that effective February 1st, 2016 they will no longer recognize permits from any but 4 states. This DOES NOT effect people who have the Virginia concealed carry permit. 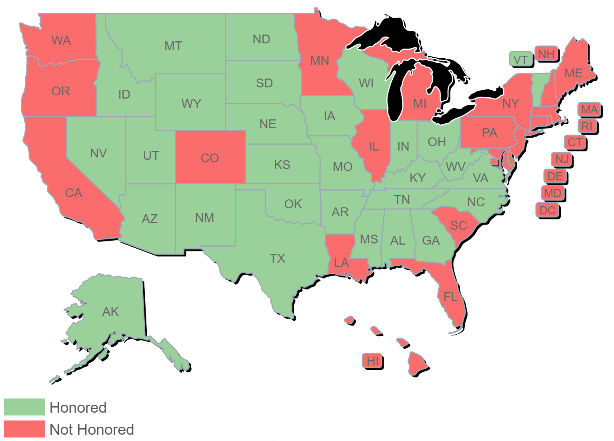 Thus it wouldn't effect you in getting your VA permit or carrying concealed in the states we show in the map below. What If I already have a permit? Well, we still think you would find the course content valuable and there is nothing to keep you from getting additional permits. You might find that carrying the Virginia permit in addition to your current permit will give you more flexibility when you travel. below and it DOESN'T matter what state you are from. *DISCLAIMER: Attn Residents of Georgia, Indiana, Kansas, Kentucky, Nebraska, Nevada, North Carolina (specific counties) Oklahoma, Tennessee, West Virginia, and Wisconsin. While the Virginia permit is honored in your state, your state requires that residents obtain their local state permit in order to carry concealed in the state. In other words, a resident of any other state with a Virginia non-resident permit can carry concealed legally in your state but you could not unless you have a local state Concealed Carry Permit. We still invite you to obtain your Virginia permit so you will have reciprocity with the other states shown.
! !REMEMBER IT DOESN’T MATTER WHERE YOU LIVE OR WHERE YOU ARE FROM. TAKING THIS CLASS WILL QUALIFY YOU FOR A PERMIT THAT IS VALID IN ALL OF THOSE STATES!! What about the red states? If you live in a state that doesn’t honor the Virginia permit you can still get this permit. Perhaps you live in a state like California, Maryland, New Jersey, or New York where getting your permit is virtually impossible. Getting the Virginia permit would at least give you the right to carry concealed in dozens of states where you travel. When you sign up for this class today you will immediately receive a coupon pack valued at $185. Coupons provide discounts up to $25 on various industry proven products that you will probably need anyway. 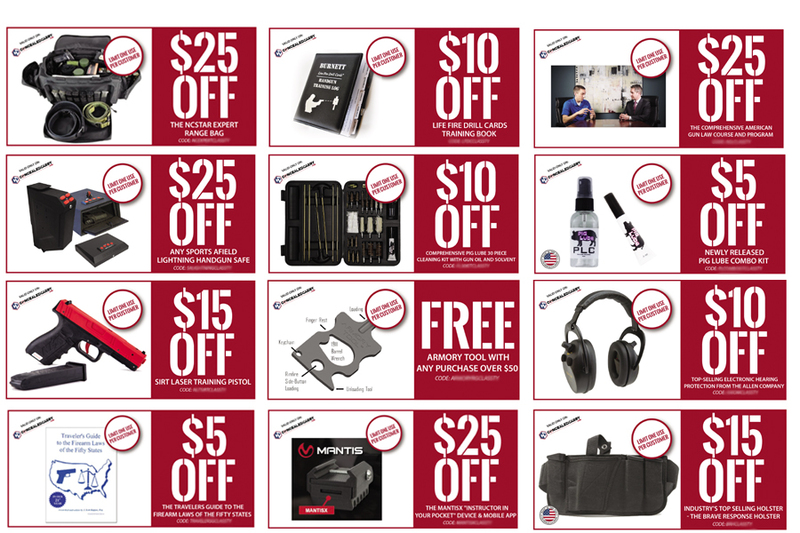 Products include: Gun law books and videos, training pistols, holsters, gun cleaning products, gun safes and cases, training tools, hearing protection, and more. 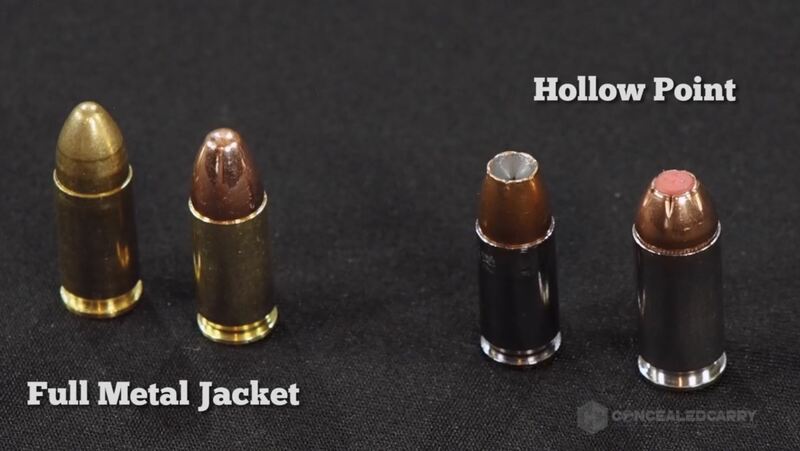 This guide is designed for the new concealed carry permit holder. 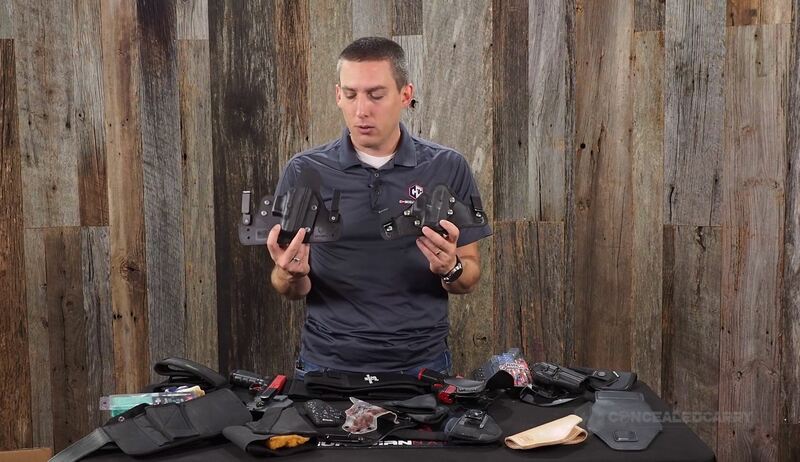 Everything you need to know to shop for, pick out, and purchase your first self-defense handgun. Three Steps to Getting the Best Deal! 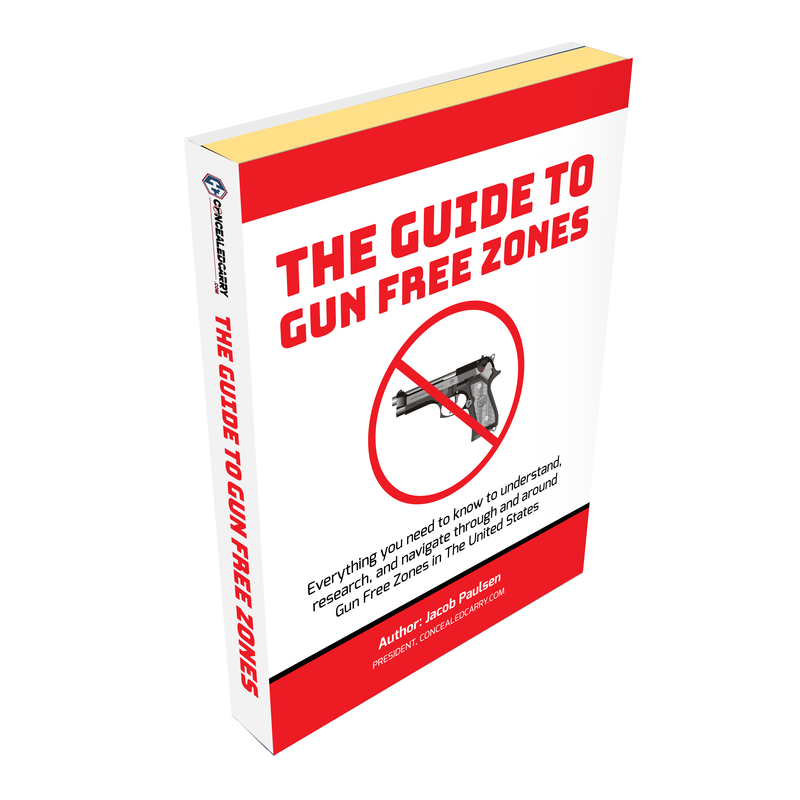 This guide was developed as a resource for newer concealed carry permit/license holders who want to understand the laws and regulations that govern Gun Free Zones. Learning the most common practices for both government entities and private property owners allows you to know where to look, what to ask, and how to avoid trouble day to day. 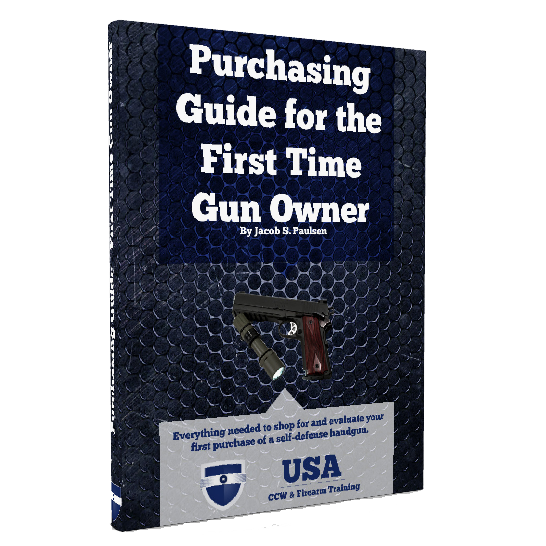 Since regulations are often different from city to city or state to state this guide gives the gun owner a framework for navigating the varying regulations and laws that ultimately determine where you can and cannot carry. Consider that spending time on the range with me costs about $350 per hour. Your average concealed carry class in person costs appx $200. I’m not going to charge anywhere near that amount. 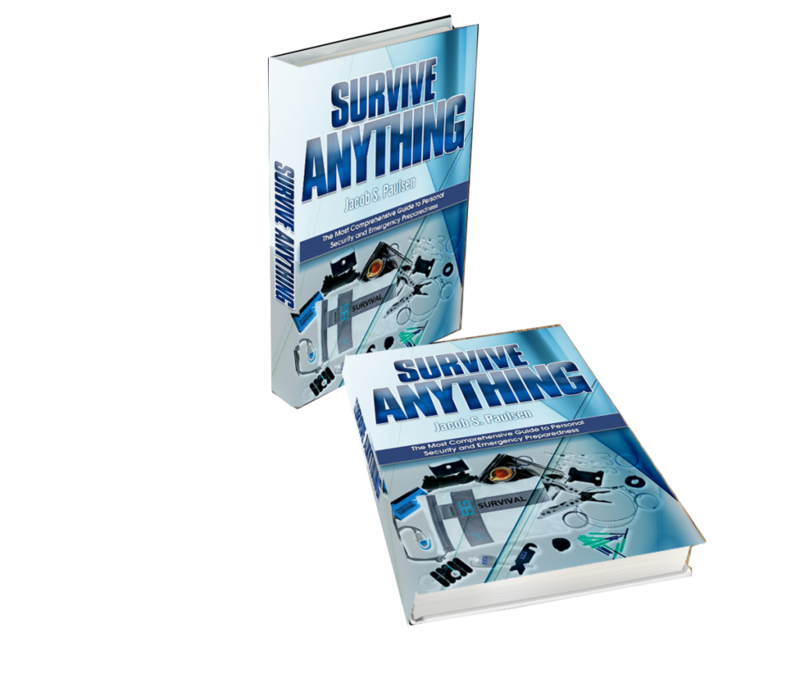 Today I’m pleased to offer this online-only course including the free bonuses for the low cost of $39. Seriously it would cost you more than that just in ammunition to take an in-person concealed carry class. Why Such a low price? Because I want the maximum number of people possible to take this class and get this training. 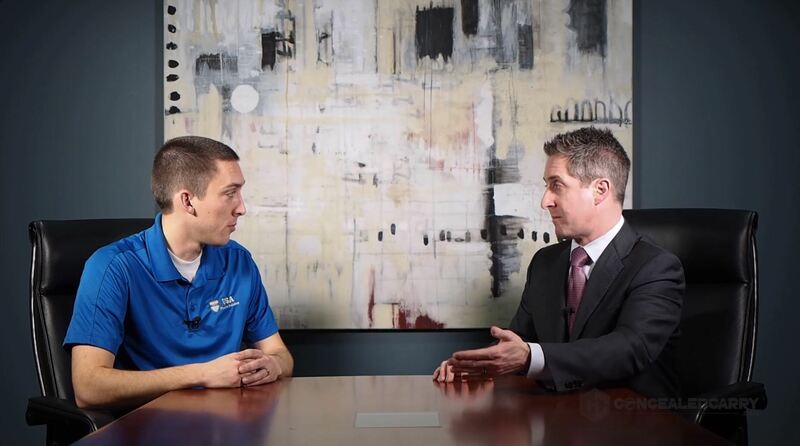 In addition, we offer a lot of other online training and I’m confident that after you see the value in this course you will want to continue your education with me and my team. *Also please note that the $39 investment doesn't include the $100 application fee payable to the State of Virginia when you send in your application. Professionally presented class with many good points addressed. There’s no substitute for good judgement and safety and Jacob presents that very well in his class without beating you over the head with it. This is an excellent class that is informative for beginners as well as the advanced, don’t hesitate taking this class it’s worth your time. – C.S. I feel Jacob gave a very polished, concise and professional class that I would and indeed have recommended to friends and family. – Andrew J. Great class! Very informative and educational. 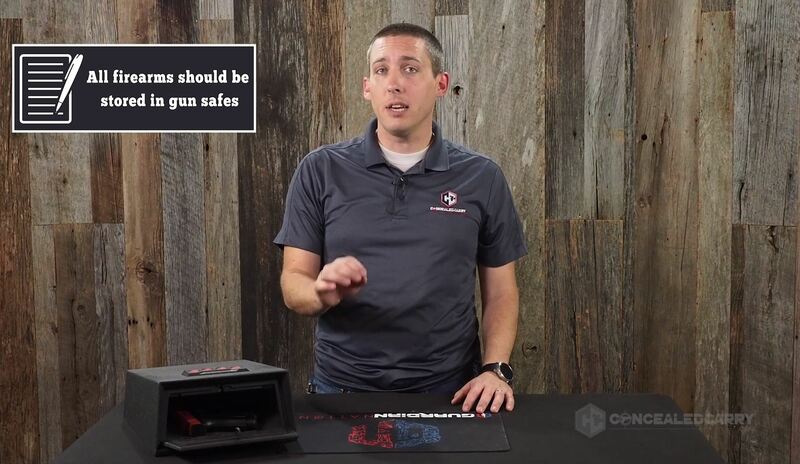 Jacob knows a lot about CCW and had very helpful information to share. He’s a great presenter and made the class entertaining. Pleasantly surprised and would recommend anyone to take this class from Jacob. – Lisa B. Class was informative and flew bye. I have Hunted and owned firearms for the past 41 years and still got schooled. Good Job!!! – Andy S.
Very good course. Well taught by Jacob Paulsen. I am retired military and a competitive shooter who learned a lot from the class, which was required to renew my CCW permit. – Jim B. Myself and my wife took Jacob’s class yesterday. I must say Jacob has it all together, has an outstanding knowledge of firearms and presents it to you in a very professional manner. When you have finished the class you come away a with new knowledge of firearms and CCW. Would recommend this class to everyone. – Jim G.
I was very pleased with the class and the professionalism shown by Jacob Paulsen. I took the class yesterday with my girlfriend. We are both fairly new to the gun world so we appreciated the pace of the class and came away with many topics for us to discuss together. I also enjoyed the fact that the class never became political or a soapbox for anyone to preach any social message. It was everything we needed and nothing we did not. Thanks. – Michael B. This class was very informative and is highly recommended for anyone interested in obtaining their CCW. Jacob has a friendly demeanor, great presentation style, and offers the information in an easy to follow manner. – Steven G.
How Much is the Virginia Application Fee? I don’t know how much longer the State of Virginia will allow this to happen but once you have your permit you have it. I wouldn’t wait a moment longer… click the add to cart button and get started today! 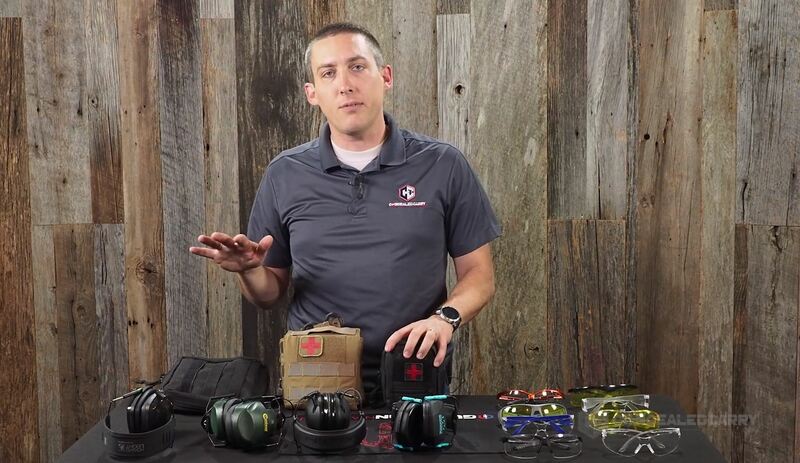 Thank you and I look forward to being your virtual firearm instructor! 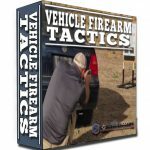 I took this online course several months ago and I found that the course was up to date and very serious about Concealed Carry. I just recieved my Virginia Nonresident Concealed Handgun Permit which gives me Concealed Carry in several other states. I feel that this online course was very well worth the cost and it will help get you a nonresident permit.